The "infernal" landscape of fumaroles, vapors, rocks and thermal springs in Sasso Pisano making up the landscape of the Cecina valley; the high "Balze" cliffs stamping their character on the rugged landscape to the west of Volterra, explored from below, so as to touch them; the landscape of alabaster quarries, with workshops and factories, so tied to the city's history. * UPDATE: 3 places still available! Mornings will be dedicated to the observation of how these various materials can be handled and transformed, with a sketched reportage about craftsmen and industrial manifacture (with Simo Capecchi). 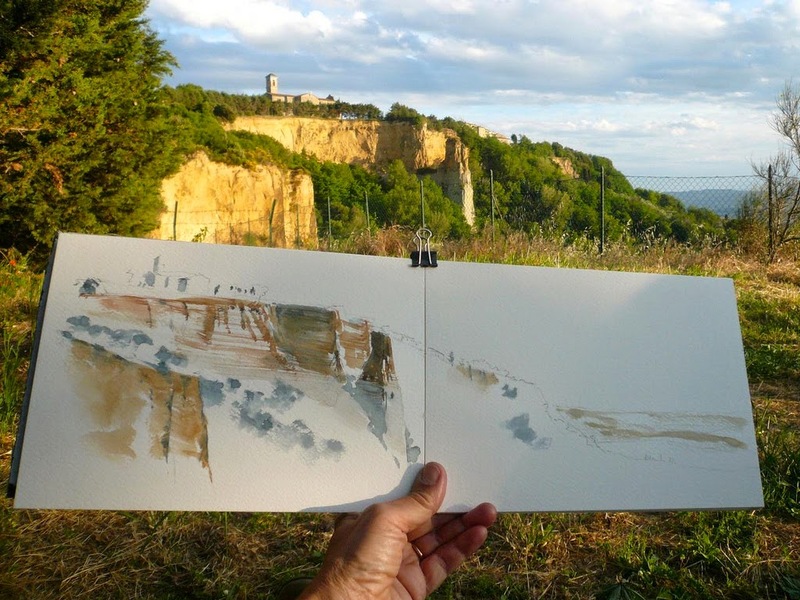 In the afternoon we will be painting and sketching amongst the different natural and artificial landscapes which have their origin in Volterra's peculiar geo-morphological composition, materially representing these elements through ink, crayons and watercolors and collage (with Caroline Peyron). 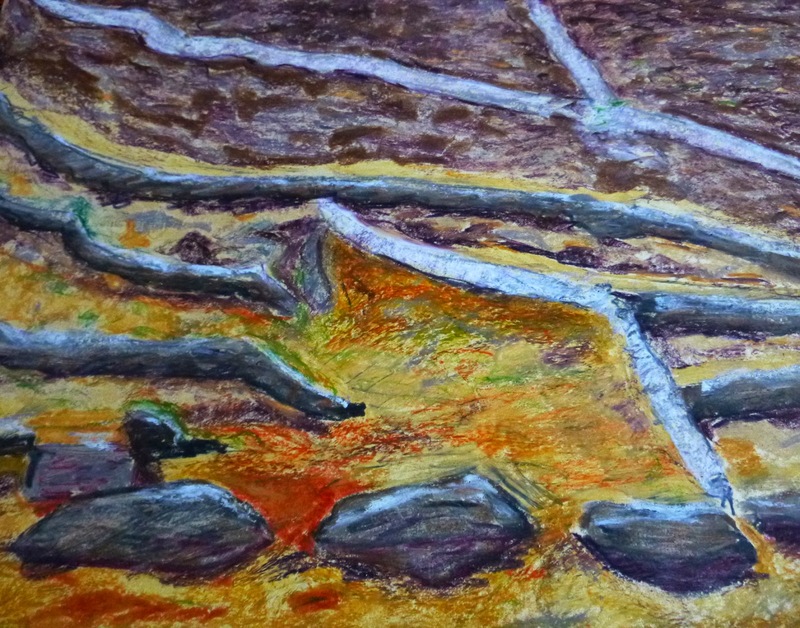 Goals of these four days of painting, sketching and exploring is to improve our observational attitude, going deeper into reality, trying to capture the qualities of the elements that form our landscape. Participants will focus on reportage and storytelling aspects of sketching, to show how Volterra's geological diversity influences the lives and products of designers and artisans. This workshop is organized in collaboration with da Volterra Werkstatt, a Klaudia Ruschkowski and Dirk Oelbermann recent project aimed to promote interaction between art, craft and design, involving renowed artists working on traditionals and local materials (stone, wood, terracotta, alabaster) to produce hight quality design objects. As usual we will be hosted in villa Le Guadalupe. Spazio per le Arti by Klaudia Ruschkowski and Wolfgang Storch, enjoying their company and their delicious meals - already a must in our workshop. Watch past editions photos to get an idea of a very special place that will really inspire you to paint. 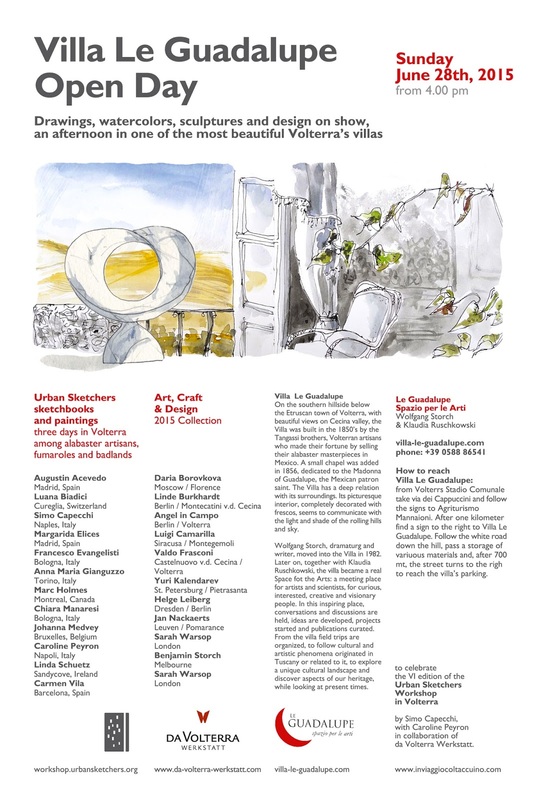 10 am - 7 pm : painting tour into Le Balze, under Volterra's etruscan city walls. 4 pm: Open Day in Villa Le Guadalupe, everybody invited! Le Guadalupe. Spazio per le Arti is an association dedicated to arts by germans dramaturgs Wolfgang Storch and Klaudia Ruschkowski that hosts workshops in arts, theatre, design and music, with an international program. Le Guadalupe is located in a XIX° century villa, with a view on the southern hills of Volterra, with beautiful gardens around and interiors covered with frescos. They have been hosting us for the past six years! Workshop tuition is 220 euro (including 21 hours lessons) plus 130 euro for meals (including *6 suppers/dinners in villa Le Guadalupe, hosting institution). 10% of this workshop supports the Urban Sketchers nonprofit program. Workshop locations: Check our Map here. Find out how to reach Villa le Guadalupe, 10' from Volterra city center. Accommodation Check out suggested hotels in our workshop map. Rome (4.30 hours) : train to Cecina + bus connection to Saline di Volterra. We'll help with bus timetables and we'll pick you up from bus station. No problem if you came without car, we'll organize transportation to and from Villa le Guadalupe - Volterra. 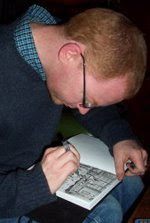 Participants Maximum 15, each level of drawing experience is welcome. 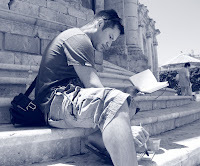 Workshop italian translation in Le Guadalupe web site. 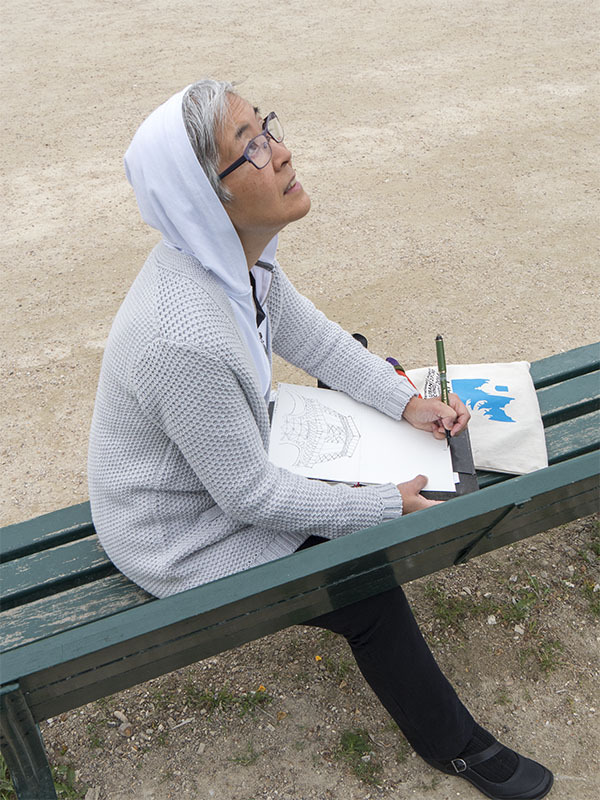 Meet the instructor / Simonetta Capecchi completed her PhD degree at the University of Naples (Italy) in Architectural Drawing and she works as an illustrator. 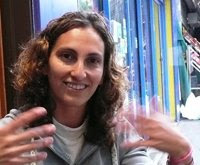 Simonetta has lectured and leaded free-hand drawing courses for ten years at the Architecture Faculty of the University of Naples. 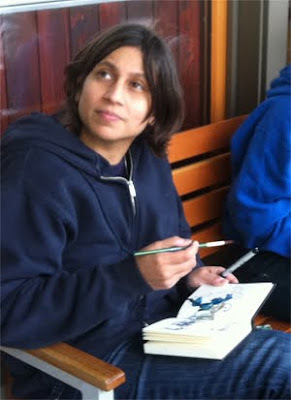 She has been an instructor in Urban Sketchers Symposiums of Portland, Lisbon, Santo Domingo and Paraty. She helds Urban Sketchers Workshops annually in Naples and Volterra and has held workshops and sketchwalks in several occasions in Italy and in Paris. She is a correspondent for Urban Sketchers from Naples, where she lives. 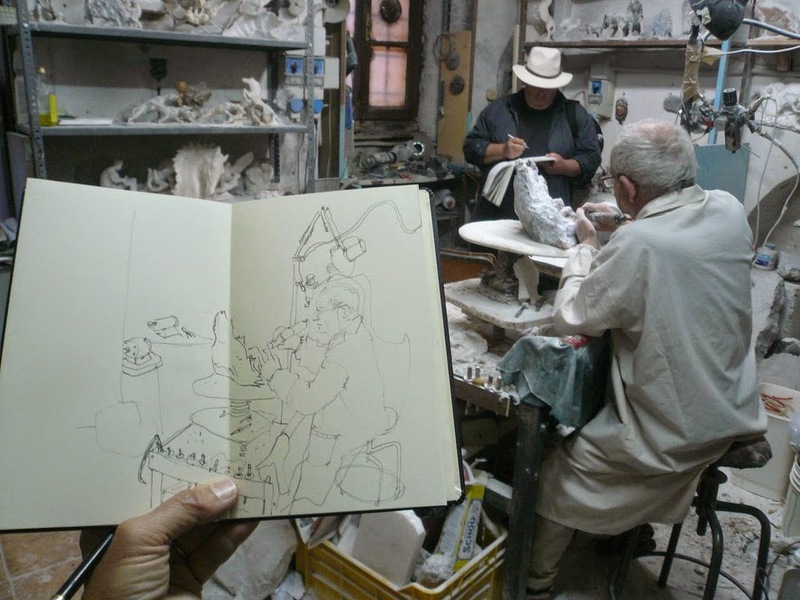 Meet the instructor / Caroline Peyron is a french artist living in Naples. Personal exhibitions of her works has been held in Naples at the Grenoble Institute Francaise, in the Biblioteca Nazionale, in Castelnuovo municipal museum and Museo Archeologico Nazionale. Caroline has been an art teacher and has held workshops for private schools and public institutions for over twenty years now. She holds art classes with children, adolescents and adults for cultural institutions like Museo di Capodimonte and Museo Archeologico Nazionale of Naples. With Simo Capecchi she exhibited altered books: Libri Artefatti, was in L'Aquila with Una carriola di Disegni and organized the 3 MUSEI sketchwalk. Watch a Caroline's performance in a slideshow and a video.